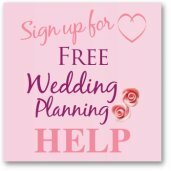 Wedding pew decorations are not a necessity but they do look lovely and are a great way to add your color to your ceremony. Thankfully there are lots of ways to decorate without it costing a lot. Book the church at least six months in advance. In some areas, reservation is at least a year in advance. Once you have booked the church, ask the church coordinator what are allowed and not allowed for church and pew decorations. There are churches that allow wedding pew decorations and there are some churches that do not. In most cases, pew decorations are allowed as long as you do not nail, glue, or tape your decorations to the pews. Now that you know what are allowable, plan your pew decorations. 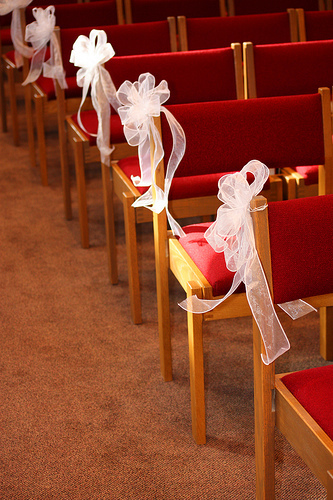 It is best to go for simple yet elegant pew decorations. 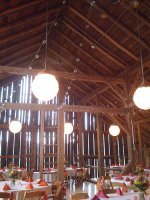 You can rent from a florist or borrow from the church special holders for the flowers. You also have the option to use pew clips or loops of ribbons for securing flower arrangements on the pews. Count the pews on one side. Divide it by 2 then multiply by 2 and that's how many flower arrangements you need to do for the pew decor. There is no need to put a decor on each pew. Every two or every three will do. 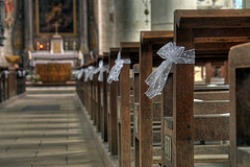 The easiest way to do wedding pew decorations is by doing swags of soft tulle on the pews. 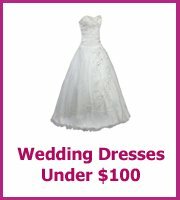 You can buy a bolt of white or cream tulle then gather and swag them at every two pews. You might want to use a pew clip to hold the tulle. 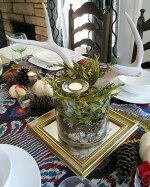 Get some ornamental twigs from the florist, tie 2 to 3 twigs together and glue on some satin calla lily and finish with a satin ribbon (white or the wedding's motif) then attach to the swag by means of the pew clip. Tulle can also work well as big bows tied onto each end chair. Another good and inexpensive idea is flower balls. Buy igloo-shaped foam bouquet holders. Order some fresh carnations in advance. Cut them in desired lengths so that you can stick them into the rounded foam that has been soaked in water. Make sure the flowers are stuck deep into the foam bouquet. You might have to wire the stem of the carnation for it to hold well. A loop for the ribbon is integrated into the igloo-shaped foam. Thread the ribbon in the loop securing it so you can attach the ball of carnations on the pew clip. 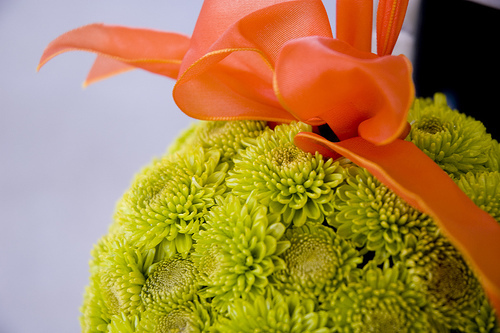 You can opt to do topiaries of different flowers - all colors and shapes. Buy some cone-shaped flower foams and matching container of white plastic pots. Order different flowers in advance - daisies, mums, roses, carnations, baby's breath and ferns- from a local florist. Make a trial topiary so you have the confidence to do them before the wedding. You can do the topiaries a day or two in advance as the flowers won't wilt since you'll be sticking them in flower foam. Just make sure that you soak the foam in water overnight or at least for 6 hours. Ask your friends and family to help you out as doing 10-15 topiaries is not easy. Set the topiaries on the floor in front of pews. These are double purpose for the topiaries will serve as wedding pew decorations and decor for the aisles. Set some containers with loose petals on each pew so the guests can use these to throw on the newly-weds after the ceremony. 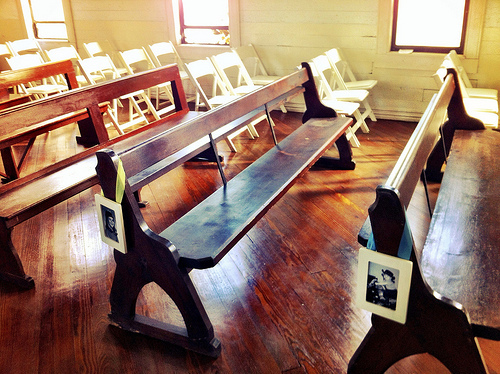 Love this idea to decorate your wedding pews! You could have photos of each of you on your family's side if you are planning on having a traditional ceremony or you could mix up the photos and have both of you through the years, as you get closer to the front they could be photos of both of you. Almost a trip through the years!